Tribal tattoos that have a symbolic meaning are cool. This guy’s arm sleeve looks like just a bunch of nonsense designs. Too many guys opt for tribal tattoos just because they think they will make them look cool. This guy thought wrong. His tribal arm tattoo is inked in black and is made up of a variety of seemingly meaningless shapes and lines. 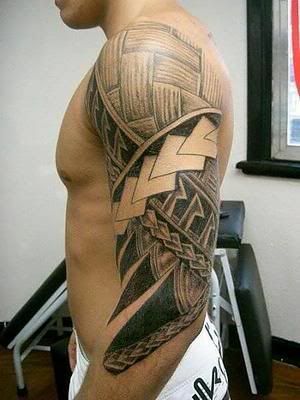 The sleeve tribal tat begins on top of his left shoulder and extends all the way past his elbow onto his forearm. Tribal tattoos are one of the oldest types of tattoo designs for men in history, reaching back to the Maori people of New Zealand. Traditionally, tribal tattoos were inked on men as a symbol of something deeply important to the wearer, whether its meaning was associated with culture, religion, spiritualism, or even magic. Unfortunately, guys like the one in this photo often ink themselves with meaningless tribal tattoos just because it’s trendy.